To generate the source and reference statements for my parent's marriage certificate (image attached) as part of a collection; I've tried to follow the guidance of the 3rd edition of EE, "Privately held materials," section 3.25. Jessie Cousland (Murison) Gauthier Papers. Privately held by Gary David Gauthier, [ADDRESS FOR PRIVATE USE,] Calgary Alberta, Canada 2018. Gauthier-Murison marriage certificate, citing the marriage of Joseph Albert Gauthier (birth place Ontario) and Jessie Cousland Murison (birth place Calgary) on 27 May 1948, in Ottawa[, Ontario, Canada]; Jessie Cousland (Murison) Gauthier Papers, privately held by Gary David Gauthier, [ADDRESS FOR PRIVATE USE,] Calgary Alberta, Canada 2018. 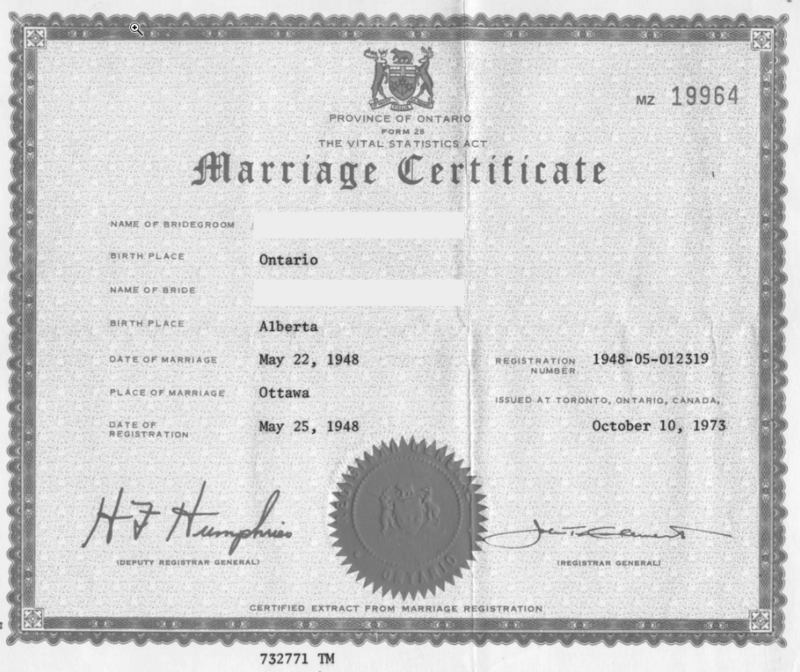 Issued by the Province of Ontario at Toronto, Ontario, Canada, on 10 October 1973; this certificate is a certified extract of the marriage registered on 25 May 1948 as No. 1848-05-012319. Upon the death of Jessie Cousland Gauthier on 5 April 2018, this certificate was passed to her son Gary David Gauthier. Gauthier-Murison marriage certificate, Jessie Cousland (Murison) Gauthier Papers. History-Hunter, you've handled it well. EE would be inclined to leave out the square brackets around the place ID. Square brackets are used when we, as writer, insert information into a quoted passage. (It's a trigger warning: I'm adding something that is not in the material I'm quoting.) When we write a citation, we are the creator of that citation. We aren't quoting someone else—unless we specifically put certain details in quotation marks as when we are copying a source-of-the-source citation to reflect exactly what our source said it used. Those who prefer to keep citations as lean as possible might also question the need to cite birthplace data for both parties. Typically that information appears in the text to which the reference note is attached. That said, in your own working research notes, you can record anything that you feel will help you do a better job of research. The reason for noting the birthplace was the result of thinking that it might resolve any ambiguity about the couple in question.However; to locate the correct marriage record and issue a certificate, the Ontario government only requires the names of the parties involved, the event date and the city in which it took place. I suppose there must be something left to learn from ordering a certificate :>). So; in retrospect, this is likely not required. Initially, I usually put my citations in a research metadata file (you might call them "working research notes"), which is associated with an image of the item. The metadata file actually contains my "live" research notes and other information relative to the item. The citations are later simply copied into my database program or any relevant documents. As such, including a "publishable" version of the citation is the best approach for me. Any relevant information, which is not in the citation, can be included/found elsewhere in the file.